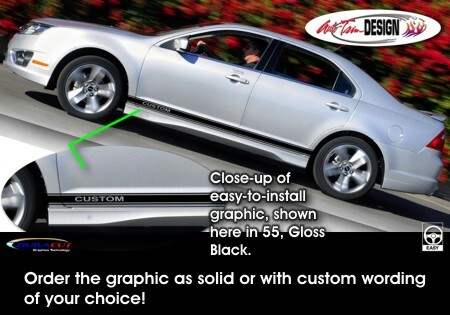 Set your '06-Current Ford Fusion apart from the rest with this great looking body side graphic set. Available in a wide variety of colors, overall graphic measures 79"x 2.75" (200.66cm x 6.99cm) and is packaged with one (1) left and one (1) right side graphic. Trimming required at each door jamb and wheelwell.